Hello, demure readers! I’m Becca from the blog, Super Style Me, and Lauren Blair asked me to do a guest post while she’s out having some much-deserved birthday fun. I started Super Style Me earlier this year, and it’s all about finding your own personal style no matter your size or shape. In that time, I’ve met many-a-blogger on the web, Lauren included, thanks to social media. Here are my experiences with different social websites, and how I’ve used them to help my blog grow. Instagram ranks as the number one social media website for me because of what it has done for my blog and how it connects me to other people interested in fashion. You can fit so much awesomeness to a little square picture! As a blogger, I can promote new posts as well as throw in some extra photos of my everyday adventures. On Instagram, you can find interesting peeps and pics by searching hashtags, and you can hashtag just about anything…#fashion, #nameofstore, #articleofclothing, etc. Also, you can make connections by liking and commenting on others’ posts, and if you’re genuine and not spammy, you might just have a new friend. Lately, I’m working on not over-sharing on IG. While I love that I have several Instagram followers and I’d be ecstatic to have even more, I’d also like for those nice people to check out my blog. However, if I post every picture from the blog onto my Instagram feed as well, what incentive am I giving anyone to go to Super Style Me if they’re seeing it already on IG? Lately, instead of posting full outfit shots, I’m getting a little more artsy and posting close up shots featuring an accessory or an outfit detail, like in the above pictures. From there, I hope people will go to my blog to see the rest! Not all of my Instagram pics are fashion-related, as you can see above. Sometimes I post about my hobbies and of course the obligatory food and pet pics (#dogsofinstagram). I recently got a DSLR camera, and it has been inspiring me to learn a bit more about photography. One book that has helped me take better pictures is by the bloggers at A Beautiful Mess http://www.abeautifulmess.com/2013/08/a-beautiful-mess-photo-idea-book-is-here-.html. They share great ideas for location, lighting, props, framing shots, and more that you can use even if you just have a smartphone camera handy. 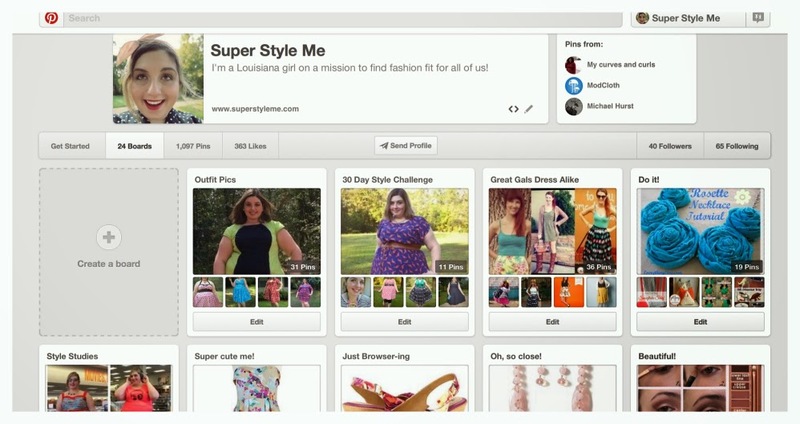 On Pinterest, I can share my blog posts and their inspiration. I have boards for my outfit posts, things I wear, and DIY projects. One of my Pinterest boards I love the most is “Great Gals Dress Alike. 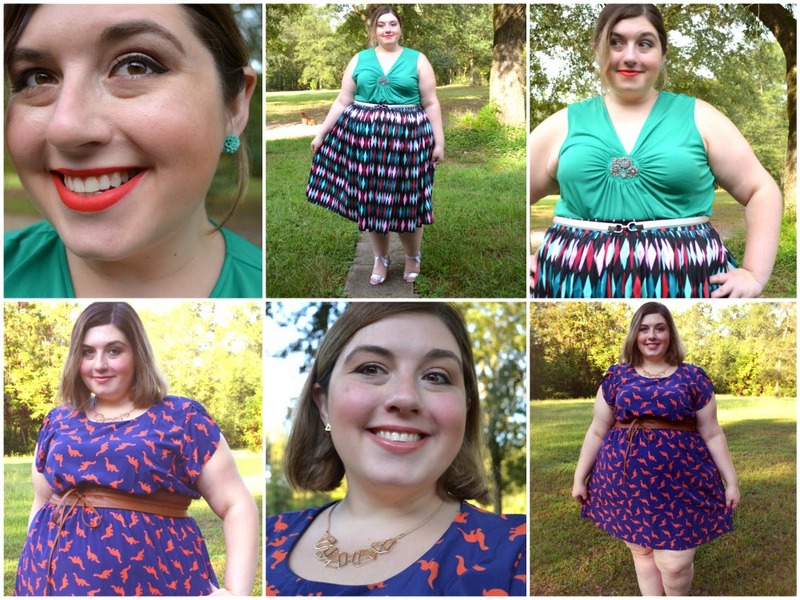 When I started blogging, I figured Super Style Me would be focused mostly on plus size fashion. However, I found different retailers that cater to a full spectrum of sizes, and I saw bloggers of all shapes wearing the same clothes as me. This board is my way of giving a shout-out to all the bloggers who share the same of love of certain pieces of clothing as I do, and it’s also my way to show how garments fit in different sizes. I mainly use Twitter to let retailers know when I’m wearing their clothes. 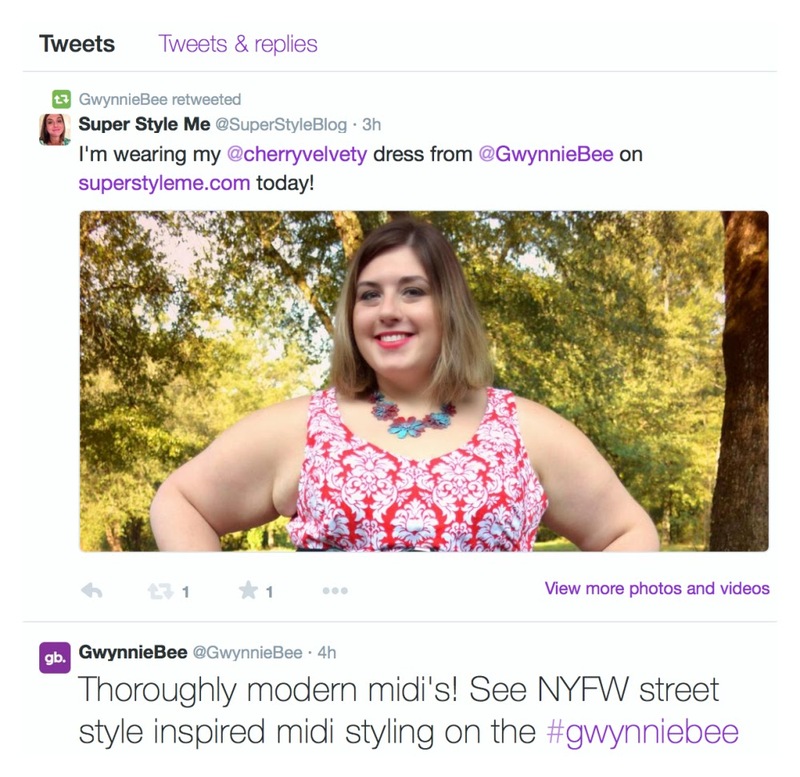 In the above picture I tweeted Gwynnie Bee to let them know I did a blog post featuring one of their dresses, and they, in turn, re-tweeted the picture on their feed. Also, by tweeting outfit pics to companies, they may use them in other areas of social media – anything from Pinterest to their own websites and newsletters, thus giving me exposure for my blog. Don’t forget to socialize where you shop! Many online retailers give you opportunities to give product reviews and to showcase your fashion sense. 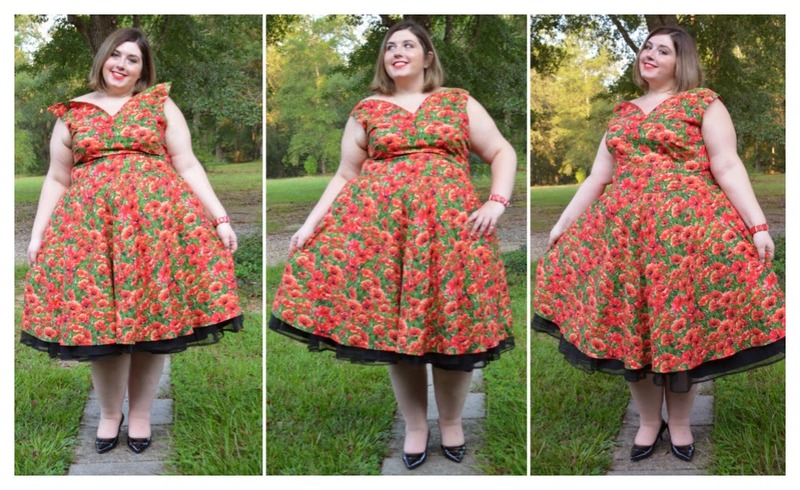 For instance, ModCloth has their Style Gallery(click here for mine) where you can post your own outfit pics. There are moderators who vet submissions, but usually you’re good to go if your outfit is tasteful and your picture isn’t too out of focus. They’ll also link to your blog! In fact, most of the bloggers I follow, I saw them in the Style Gallery first. But wait, didn’t you forget Facebook? I’m one of the strange individuals who stays away from FB due in part to some bad personal experiences I’ve had in the past. Those feelings aside, when it comes to blogging, I think the over-sharing of blog content that I discussed earlier can run rampant on Facebook. While my intentions would be to promote my website, I could end up with a Facebook page with more traffic than my blog itself. While I don’t think Facebook is a bad thing to get your blog’s name out there, I would advise not to give your FB likers more than a taste of what’s on your blog. That gives them a reason to go to your main site. Thank you for reading some of my musings and ramblings about social media. I hope this gave you a good idea of what’s on the web for fashionistas and some smart ways to share your style. Thanks and happy birthday to Lauren, who is a wonderful blog hostess, and I’ll see you all online!